Gail Risner opened the meeting at 8:05 a.m. Twenty-one (21) members were present. We welcomed four new members: Judy Scribner, Frances Hickey, and Ann & Mike Santogatta. A new Naples Walking Club business card was viewed by members, and cards are available for members to distribute to recruit new members. Treasurer’s Report: Marsha McGuinness reported that the club has $389.57 as of November 10, 2018. She presented and reviewed a financial report for club income and expenditures from October 3, 2017-November 10, 2018. She then indicated that she would be stepping down as Treasurer. On behalf of the club, Gail thanked Marsha for the wonderful job as Treasurer for almost two years. She also thanked Carole Levick who has served as Assistant Treasurer. Interim Treasurer: Lucy Sparrazza will serve as interim Treasurer. Lucy reported that the club has now been registered with the state and that she will be setting up a free checking account under the club’s name. 2019 dues can be paid via cash or check. Checks should be made payable to Naples Walking Club. Dues payments can be given or mailed to Lucy. T-Shirts: Debbie Vallante reported that an order will be placed as soon as 12 shirts are ordered. She reviewed the new form that is available for ordering a shirt. Shirts are $11. Nominations for the open positions were requested. Barb Daltorio volunteered as a nominee for the Marketing/Publicity Director position which will also handle social media for the club. A tour of the Sugden Theatre “Behind the Scenes” is scheduled for Thursday, November 15, 2018. Currently 8 are signed up to attend and there is still available space in the tour. Let Mary Ann know if you would like to attend. Mary Ann reviewed options for the Christmas Party and/or Welcome Back Party. An email will be sent to members to determine if the club wants 2 parties or 1 party, and what the preferable dates and locations are. Carole Levick will check on the availability of her clubhouse. Mary Ann indicated that her clubhouse would most likely be available if we scheduled a party in January. Members indicated that they would like to resume the monthly evening walks. Mary Ann will schedule the next one for the 1st Monday of the month beginning in December. Joanne Dempsey reported that the Naples Pathways Coalition has asked that we co-sponsor a walk with them on Saturday, January 19, 2019 as part of the 1st Annual Paradise Coast Wellness Experience. The walk will start at 8:00 and we will have a table at the Greenway entrance with our banner, a brochure and application for club membership. Members were excited about this new event and opportunity to recruit new members. Mary Ann indicated that the Naples Daily News Half-Marathon will be held on January 20, 2019. We will once again be manning the first water station. Volunteers were requested and a sign-up sheet circulated. Details will be included in the newsletter that Joanne will be emailing. Gail closed the meeting after asking and receiving approval for the April 7, 2018 Minutes. Next Meeting: The next meeting of the Naples Walking Club will be on Saturday, December 1, 2018 at the Greenway. This year’s participants in the Annual Heart Walk in Naples. Always fun! Posted in Photos, Uncategorized	| Comments Off on This year’s participants in the Annual Heart Walk in Naples. Always fun! Our farewell walk with Mary Moran at the Greenway on Saturday, June 23. Our farewell walk with Mary Moran at the Greenway on Saturday, June 23. Mary will be sorely missed, but Atlanta is gaining a true treasure. And she promises to return for frequent visits – YAY! Best of luck on your new adventure Mary from all your Naples Walking Club friends and fans!!! Posted in Photos	| Comments Off on Our farewell walk with Mary Moran at the Greenway on Saturday, June 23. Gail Risner opened the meeting at 8:20 a.m. Seventeen (17) members were present. Happy Birthday to our members who have April birthdays: Gloria Cahill 4/2, Dave Leisen 4/28, and Carol Mumford 4/18. Treasurer’s Report: Marsha McGuinness reported that the club has $952.44 as of March 31, 2018. We currently have 50 paid members. Check for membership dues should be made payable to Marsha McGuinness. Marsha also indicated that a thank you letter was received from the National Alliance on Mental Illness (NAMI) for our donation. T-Shirts: Members should send an email to Debbie Valente if they are interested in ordering a t-shirt. She will send an email with the current inventory of shirts available for purchase. Beginning at the April meeting a t-shirt will be given (from our t-shirt inventory) to the first member who answers a question correctly. This month’s question was “how many steps does someone need to walk per day for overall health?” Bobbi Schuster was the first to have the correct answer—-10,000 steps. Wendy Bright and Gail Risner will investigate registering the club as a non-profit organization. Recently a member was not able to get a non-profit organization discount at On-the-Run since the club is not officially registered. Barb Daltorio will prepare some business cards for the club to be used to recruit new members. Mary Ann Bohannan will schedule another Monday evening walk at Clam Pass soon. She will be sending an email with the details. Gail asked how many members were interested in reporting their mileage and if there was an interest in changing the way mileage is reported and rewarded. The current system for reporting mileage to Joanne Dempsey will be used. Any recommendations for changes should be submitted to Gail. Mary Moran recommended that the club consider a walk and tour at Koreshan Park. Barb Daltorio offered to organize the walk and inform members. Mary also suggested a walk on the 5K hiking trail at Collier Seminole State Park. She will determine a date and coordinate the event. Gail closed the meeting after asking and receiving approval for the March 3, 2018 Minutes. Next Meeting – The next meeting of the Naples Walking Club will be on Saturday, October 6, 2018 at the Greenway. Gail Risner opened the meeting at 8:16 a.m. Twenty-one (21) members were present. Happy Birthday to our members who have March birthdays: Ginny MacDonald 3/9, Emil Peyrot 3/28, Bobbi Schuster 3/17, and Sarah Sprague 3/24. Treasurer’s Report: Marsha McGuinness reported that the club has $1,115.53 as of February 28, 2018. We currently have 48 paid members. Check for membership dues should be made payable to Marsha McGuinness. T-Shirts: Debbie Valente indicated that she is in the process of building a new order for t-shirts, including the new V-neck tank tops. Send her an email if you would like to order a shirt. An inventory of current shirts available for purchase was also available at the meeting. Open Positions: Gail asked for volunteers to fill the Marketing/Publicity Director & Club Historian/Photographer Board positions. Mary Ann Bohannan reminded everyone about the Winter Party to be held at the Village Green Clubhouse on 12th Avenue South from 4-6 p.m. on Sunday, March 4th. Friends are welcome and members should bring a dish for the potluck. The Club is supplying drinks, i.e. wine, beer and bottled water. There is ample parking at the Clubhouse. Mary Ann also asked about donating St. Patrick’s Day decorations and members agreed. Other supplies will be stored. Corrie Galoubandi, a potential new member, joined in our walk and asked if members would be interested in walking on Sunday evenings from 5-6 p.m. from Clam Pass over the boardwalk to Seagate and Venetian Village. Interested members can email Corrie at cg21666@yahoo.com . Also, the Club may be interested in this walk as a special event at a future date. Mary Moran invited everyone to join in a walk in the Hills of Marco Island on Friday, March 9th. Members should meet at the Publix on Bald Eagle Dr. at 8:00 a.m. She will email detailed directions. Members can brunch at the Red Rooster following the walk. March 10th – PSP Walk at Mackle Park, Marco Island from 10:30-1:30, individual cost $25. Members approved a donation of $100 from the Club to the PSP organization. Mary will contact Carol Greenberg to see if our donation can cover the cost of any members wanting to participate in the walk. Garry Adams announced a Tuesday, March 13th walk at the Naples Botanical Gardens. The walk will begin at 10:30 a.m. followed by lunch at the gardens café. The cost of entry to the gardens for non-members is $15. Garry will send out an email with the specific details of the event. Gail closed the meeting after asking and receiving approval for the February 3, 2018 Minutes. Next Meeting – The next meeting of the Naples Walking Club will be on Saturday, April 7, 2018 at the Greenway. Here are some of the NWC members who participated in the annual NAMI walk on this beautiful Saturday morning in February! Gail Risner opened the meeting at 8:14 a.m. Twenty-one (21) members were present. Happy Birthday to our members who have February birthdays: Patricia Fermanis 2/5, Rick Baker 2/14, and Susan Camino 2/17. New Members – Welcome to new members Lloyd Adams, Susan Fisher, Jane Wendt, and Mariellen Young. Naples Pathways Coalition – Gail reported that the Naples Pathways Coalition walk was very successful and that Joanne Dempsey was instrumental in organizing the walk. Informative articles about the Coalition have been included in the Living in Naples magazine and the Naples Daily News. Treasurer’s Report – Marsha McGuinness reported that the club has $1,176.22 as of January 2018. Thank you letters for our donations were received from St. Matthew’s House and the JDRF One Walk. T-Shirts – Gail indicated that Debbie Valente placed a t-shirt order on Monday, January 29th. They usually take 5-7 days to come in. She will bring them next Saturday (for those that walk up north) and one day during the week for those that walk downtown. A club members has volunteered their home for a club winter party. Lucy Sparrazza, Mary Ann Bohannan, and Susan Fisher volunteered to coordinate and determine a date for the party. Gail introduced the possibility of reestablishing a North Naples Walking Group. After discussion, it was suggested that several walks be offered in North Naples for members to determine the desirability of ongoing regular walks. Mary Ann Bohannan suggested a new walk beginning at Barnes and Noble and walking about 2 1/2 to 3 miles out to Clam Pass and down the beach. She will schedule a date and email members. Gail asked everyone to check and update their member information on our website. Our Membership Chair will be updating the website membership list. Gail also encouraged everyone to check their email regularly for club updates. Wendy Bright overviewed three opportunities for members: 1.) The Family to Family Kids Crisis Closet is requesting donation of kitchen items for families who are setting up homes after hardship situations. Items should be brought to Wendy. 2.) Wendy and Linda McNerhany are doing a Road Scholar trip to the Smoky Mountains in September. Any members who are interested should let Wendy know. 3.) On March 2, 2018 a Lovers Key Kayak trip is scheduled. The cost if $60. Interested members should contact Wendy to register. 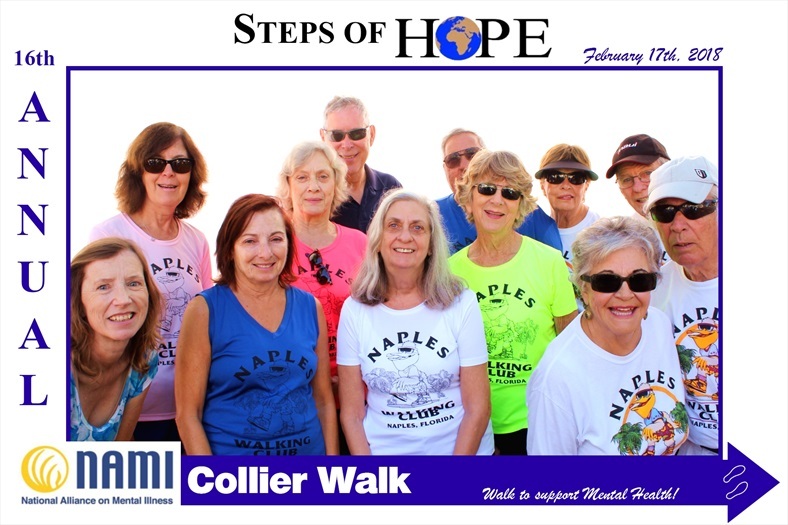 Mary Moran is scheduling a walk to the Hills of Marco Island for Friday, March 9th. More details with be emailed to members. February 17th – NAMI 2.5 Mile Walk, Cambier Park. Club members agreed to donate $100 to the walk and will allow all members to participate. Fun, food and entertainment begins at 8:30 a.m., the walk begins at 9:30 and ends at 11:00. March 10th – PSP Walk at Mackle Park, Marco Island from 10:30-1:30, cost $25. Members with over 600 miles were eligible for the $50 drawing. The winner of this year’s drawing was Linda McNerhany – Congratulations Linda! Joanne also reminded members that any items for the club newsletter should be emailed to her before the 3rd week of the month. The club meeting minutes are published on our website and are also included in the monthly newsletter. Gail closed the meeting after asking and receiving approval for the January 6, 2018 Minutes. Next Meeting – The next meeting of the Naples Walking Club will be on Saturday, March 3, 2018 at the Greenway. Beginning next month, monthly meetings will be held at the picnic tables near the entrance to the Greenway. (Feel free to bring a chair if you want). After the meeting, we will have breakfast at Panera Bread. We would like to focus on attracting new members this year. If you are on Facebook, please share any information that we post on the Naples Walking Club’s Facebook page. Other ideas are welcome. NEW – North Naples Walking Group! We are looking for someone to volunteer to organize a group for regular walks 2-3 days a week in the North Naples area. Of course, we will all continue to meet on Saturdays at the Greenway. If you are interested in doing this, please contact Gail Risner 239-398-9920, or gailrisner@yahoo.com. Tee Shirts – (Debbie Vallante) – Debbie needs six more shirts in order to meet the minimum of twelve for the next order. Shirts are $11.00 each. Also, she has some of the warmer white, pink and blue cotton shirts and wind breaker coats on hand if anyone needs them. E-mail her at debbiev1@comcast.net with questions or orders. Here is the mileage we have reported for 2017 so far. (Last month you reported is in parentheses). Please get in your final mileage to Joanne. We’ll be honoring winners at the February Meeting. Winter Party – we may possibly have a location for a party! If someone would like to organize it, please contact Mary Moran. west side of the street. We need someone to volunteer to bring coffee & bagels! help – sign them up, they will receive a free shirt too!